This weekend I started seeing indications that Nate Jaqua was in the process of signing with an Austrian side, and today there's official confirmation that Nate Jaqua has signed with Cashpoint SCR Altach. Between Joseph Ngweyna's signing with SK Austria Karnten earlier this month, the departure of Paul Dalglish, the Dynamo enter the preseason with Brian Ching and Chris Wondolowski as their only veterans at the forward position. As noted in an earlier blog, the Dynamo picked up two forwards in the supplemental draft, but it's too early to know if they'll be able to provide any assistance in filling the gap left by the departure of Ngweyna and Jaqua. While this lack of depth up front is a bit troubling, Dynamo fans can take solace in the fact that Dominic Kinnear has a knack for recognizing talent and getting good results out of players who aren't living up to their potential, Ngweyna and Jaqua are both examples of the latter. Contacts have indicated to me that Dom has been warming up to the idea of using the DP, not sure who he might be eyeing, but I think it would be a good way to add a young player from Mexico or South America up front. 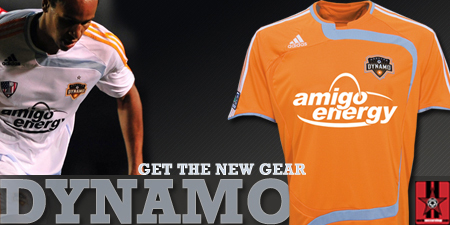 The 2008 MLS season becomes a reality for the Dynamo this Friday, when they beginning training camp. Speaking of the Dynamo's preseason, while all Dynamo fans would love to travel to Hawaii for the PPC, many cannot afford (or spouses won't let them afford) such a trip. Thankfully, the Houston Chronicle's Bernardo Fallas has suggested a cheaper alternative - the Texas Pro Soccer Festival will be taking place in San Antonio March 3-9 and during that time the Dynamo will play D.C. United, Toronto F.C., and Chivas USA at Steele High School.